In this day and time, with all the disasters happening around our country, even the kids see a need, and they want to do their part to help. 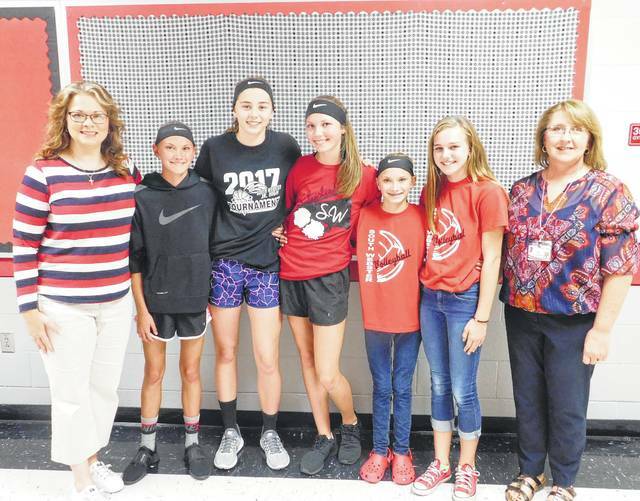 Five young ladies from South Webster Junior High School Bre Claxon, Faith Maloney, Rylee McGraw, Gracie Claxon, and Riley Raynard, have paired up with their Junior High Language teachers, Sandi Dutiel and Carla Lower, to have a coin drive in their school. It started out two separate things. When hurricane Harvey hadn’t even hit, the teachers were at a faculty meeting and Mrs. Dutiel brought it up at a faculty meeting, that maybe they should raise some money to try to possibly adopt a classroom in Texas. “Then obviously a lot of emails were going back and forth, said Dutiel – How can we help, how do we organize this? Then, our principal, Mr. Roberts, suggested that the funding drive we were doing with the faculty, could join up with what the kids wanted to do. Both Lower and Dutiel said that they haven’t yet decided, whether they will adopt a classroom in Texas or Florida. “We are going to first get the money together, then since they are both are members of several professional groups on Facebook and things like that, they could see if there is someone out there, that needs and can use the help. “The Adopt a Classroom, I had looked at for us to do at the beginning, that site was overwhelmed with responses for matching classrooms to donors. so we are just going to reevaluate, once we get the money and see what we have to work with and then try to find a classroom, said Dutiel. Mrs. Dutiel said that Perry’s Pizza has agreed to give a pizza party to the homeroom that collects the most money, as an incinitive, one for the winning high school homeroom and one for the winning junior high homeroom. She said they did this just out of kindness. The teachers complimented the girls by saying that they have done everything, from making the posters, decorating the cans, collecting the cans and counting the money and they did it all by themselves. The saying, even just a little bit helps, plays true with these girls, but by the time they are finished, it could be quite a bit. *** Mrs. Lower sent in combined total(at the end of Friday) from the change drive and the faculty contribution, mostly from the change drive, was $907.57. The winning homeroom was Mrs. Dutiel’s 8th grade. They contributed $256.36!! Both teachers said, “We’re very proud of this total!”*** Those five girls did raise a quite a bit.